Can NRI bonds be the answer to contain falling Indian rupee? Home > Financial News. Simplified. > Can NRI bonds be the answer to contain falling Indian rupee? Recently in one of the pink papers, country head of a leading international bank having operations in India as well, said NRI bond issue may be become imminent soon to contain the free-fall in the India rupee that has already impacted the Indian economy. How has the Indian rupee moved? The rupee, as many of you may be aware, has depreciated over 8.5% against the U.S. dollar since the beginning of the current fiscal year. On July 8, 2013 it hit a lifetime low of Rs 61.21 against the U.S. dollar forcing the Reserve Bank of India (RBI) to step in and resort to unconventional measures to contain the slide in the rupee.Last week, the RBI increased short-term rates and adopted measures to contract liquidity in the system. It is noteworthy that the weakness in the Indian rupee remains a threat to the country's Current Account Deficit (CAD), which in the last fiscal year touched a record high of 4.5% (at U.S. $87.8 billion) - much over the central bank's comfort level of 2.5% of GDP. While at present, measures to curb gold imports by India has paid the desired results, oil - which is another major import item for India - poses to be risk to India's CAD, since oil prices have once again ascended now after remaining quite docile earlier. India Millennium Deposits in 2001. 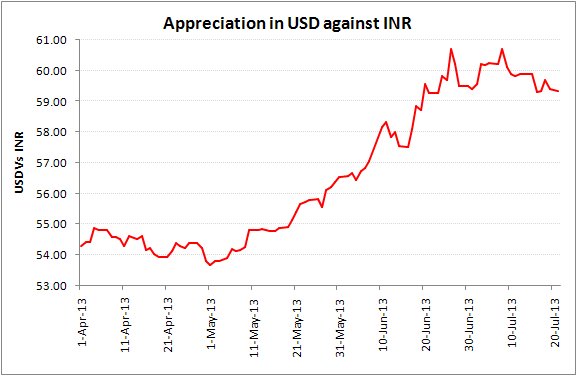 So are NRI bonds the answer to contain the fall in rupee? PersonalFN is of the view that, while NRI bond issue can be the answer to stem the fall in the rupee, it cannot be seen as the 'only' measure. Prima facie, PersonalFN believes that the investment climate has to get more conducive to attract foreign investment. Very recently, the Government has taken reform measures in this regard by increasing Foreign Direct Investment (FDI) limit in various sectors, but they aren't translating very well due to deteriorating state of Governance, lack of political consensus and risk of rating downgrade. Moreover, with India heading for general elections next year, money seems to waiting on the side line. Likewise, measure to increase export revenues also need to be taken. In such tough times, PersonalFN thinks that RBI should refrain from taking monetary policy actions which results in slowing down the economic growth further, which in turn may call a halt on foreign investment in India.